where to start with old who? Wholanta 2019 Wardrobe Portal panels -- Call for panelists! We're looking for panelists for the costume track for Wholanta 2019. Please PM me ASAP with any panels that you would like to be on. 2-3 requests tops, please. 1st come, 1st served. No guarantees that anyone will be a panelist. If you have never been a panelist at Tinegate/Wholanta, we have a brief form that needs to be filled out before consideration as a panelist. IMPORTANT: Please let me know before this FRIDAY if you want to be a panelist. The con schedule will be set on this SATURDAY. Wholanta is held May 3rd through 5th, 2019 in Atlanta, GA, at the Hilton Atlanta Airport hotel. https://wholanta.com for all the con's information, including memberships and guests attending. Here are the panels, beneath the cut. 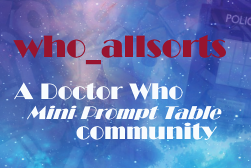 Prompt-leaving is open for the 2019 Doctor Who Minor Characters Ficathon, and sign-ups start on Saturday! Please join us in celebrating the wonderful characters that inhabit the Doctor's universe. 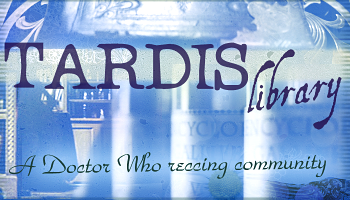 TARDIS Library's winter Seasonal Challenge is open! Simply choose your own theme for reccing and complete the challenge by reccing 5-25 works! Make your claim & find out more at the challenge post. (Challenge closes on 7th Feb 2019). And, of course, more general recs for any fanworks are also welcome at any time! Experimenting with streaming off my website. I'm experimenting with streaming a few videos off my website that aren't on YouTube. Not sure what the volume the site can handle is, but these experiments should give us the information. This one is for Dr Who. I'd appreciate hearing how it goes for you. The video is downloadable, and I won't guarantee how long I keep it up as I keep experimenting. Just a little muse inspired by Fandango's Word of the Day Challenge over on Wordpress. The word was "Cheap" and it got me thinking of my recent attempts to fill in the gaps in my 90s original Who ficiton collection. When I was a spotty little ‘erbert of a teenage Sandman I was quite a big reader, although more accurately I was a big reader of the BBC’s Original Doctor Who fiction ranges having purchased most of their two ranges and read most of them too (I think many were left unread but purchased), with only a few I didn’t read for reasons I cannot recall, probably time and they ended up getting shunted somewhere and forgotten about. Before the BBC range there were two series of original Doctor Who novels, The New Adventures which featured the then current Doctor who which was the 7th Doctor played on screen by Sylvester McCoy, and The Missing Adventures which featured Doctors 1-6. 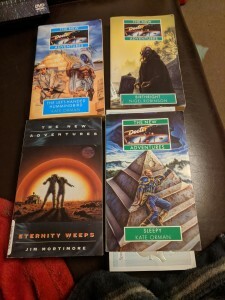 Now these were books intended for an adult audience unlike the TV series and were intended to be tales “too deep and too broad for the small screen” and after a rough start (certainly with The New Adventures) found their way. One of the best things about the range was that Virgin Books accepted unsolicited manuscripts and it gave a number of budding authors their first commercially available book, yes for some it would be their only commercially available book. Now as I said this was a range aimed for adults and I wasn’t even into my teens when the ranges started so I didn’t really read them until the towards the end of the range when they had been up and running for a while. A total of 61 New Adventures and 33 Missing Adventures were published between 1991 and 1997, the 1996 Doctor Who TV Movie starring Paul McGann signed the death warrant for the Virgin Books license as there was a brief surge of new interest in the show from viewers and, more tellingly, the BBC whom sat and noticed that there were two Doctor Who ranges which were selling and making money and decided not to renew Virgin’s license. Thanks to Twitter and in particular an account by the handle of @DoctorWhoNovels my interest in the original fiction ranges were sparked again and I decided to try and purchase the books which are now out of print. Now some where quite cheap but it seems that certain titles are selling for a lot of money. A lot of the early novels you can buy quite cheaply with a few exceptions (Timewyrm: Genesys and Timewyrm: Revelations are notably more costly then their counter parts), but cheap is not the word to describe the books at the end of the range… the going price for Lungbarrow and The Dying Days is certainly not to be looked at by the faint hearted. So at what I think will be my last splash in this area is presented below. 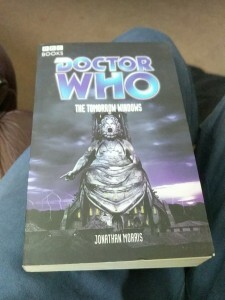 Note that Eternity Weeps lacks the Doctor Who logo and has a different cover design which shows it was a late era novel. Now I was quite lucky to get that one at a reasonable rate as I have seen copies going around for quite a hefty price and it is in good condition. The Left-Handed Humming Bird is notable because it was the first novel for the range to be written by a woman AND the first to be written by an antipodean, the author Kate Orman became quite a popular author in the range and I believe one of the Sci-Fi Literature magazines named her as an author to watch. by Jonathan Morris (not to be mixed up with the guy who presented Animal Magic) which was published towards the end of the BBC range and the print runs were smaller as sales had declined for various reasons which are worthy of analysis of their own. I play a bit of a reading spree on these so watch this space for a possible review series. Further information can be found at the comm. Click on the banner for link.